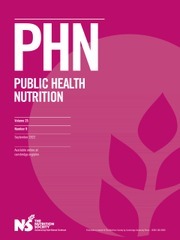 Public Health Nutrition provides an international peer-reviewed forum for the publication and dissemination of research and scholarship aimed at understanding the causes of, and approaches and solutions to, nutrition-related public health achievements, situations and problems around the world. The journal publishes original and commissioned articles, commentaries and discussion papers for debate. The journal is of interest to epidemiologists and health promotion specialists interested in the role of nutrition in disease prevention; academics and those involved in fieldwork and the application of research to identify practical solutions to important public health problems.